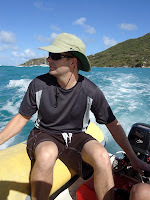 Today we're heading to the Baths on Virgin Gorda. 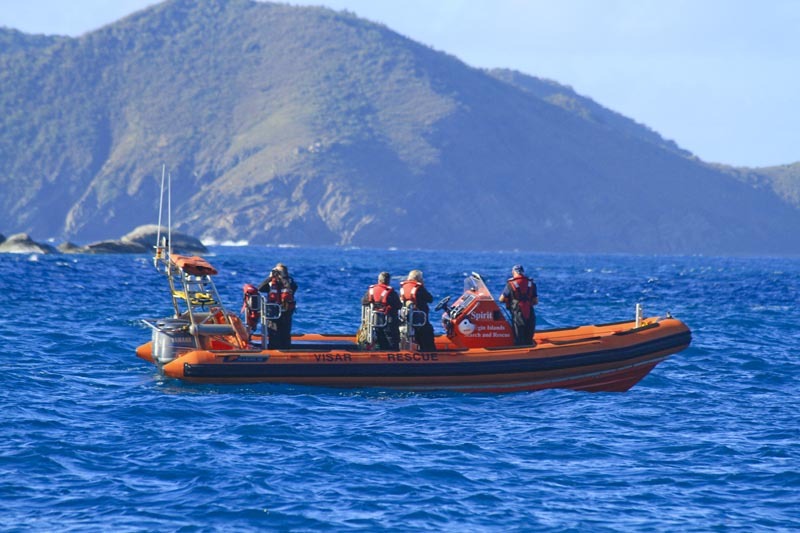 Because this is one of the more popular sites in the British Virgin Islands, we decide to head over early to ensure we get a mooring without having to hover around the other sailboats waiting for someone to leave. Randall and I get up an hour before sunrise to sail across while the girls sleep, planning to arrive at sunrise. 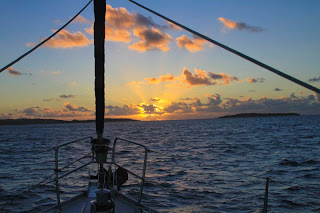 Sailing into the sunrise is beautiful this morning, the sun is crawling over the distant Atlantic horizon, sending brilliant rays of light through the Caribbean clouds. We have our choice of moorings, with only one or two sailboats ahead of us. There are sizable swells out of the north this morning, and we're aware of the surf crashing into the rocks and onto the beach. I'm a little concerned about going to shore in the dinghy because my crew is not experienced with swimming in big waves on a beach. There's no way to land the dinghy in these waves, so the girls will have to swim the last 25 yards to shore. The swim is not a problem, but the waves will make getting onto the beach challenging and a little dangerous. I watch as two dinghies head into shore. 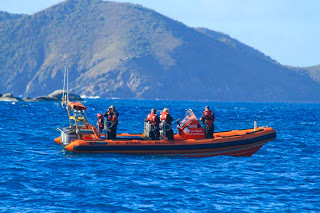 The first is full of a younger, crew and they all make it to shore without much incident. The second is another story. Watching them fight the waves and drag each other out of the surf onto the shore, I decide we're going to need another plan. Just then someone raises a red flag on the beach, warning sailors not to try dinghy landings. And off to the west, a VISAR boat approaches. So we decide to sail up to Spanish Town where we can pick up a mooring and then catch a taxi down to the Baths. 20 minutes later we are moored outside Spanish Town and begin the dinghy trip in to shore. The big north swells look even bigger from a dinghy, but we manage to make it into the harbor. A taxi to the Baths only costs $4 per person round trip. The taxi has no doors and no seatbelts, but you really don't see those kind of features until you start paying about $5 per person. The taxi ride provides an interesting look at life on Virgin Gorda beyond the beach, and in about 10 minutes we arrive at the Top of the Baths. Of course, I didn't think to bring our BVI National Parks Pass with us, so we end up paying for entrance to the park. When you charter down here, your charter company usually issues you a parks pass which no one ever asks to see, probably because they know you are coming from a sailboat. But arriving by land, we looked like lousy tourists, so we had to pay to get in. 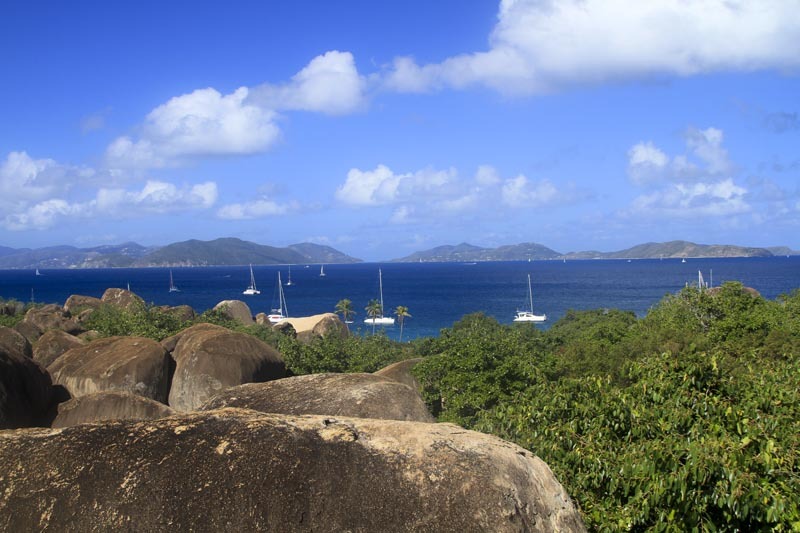 The views from the Top of the Baths is gorgeous, looking out over the lush green foliage and palm trees to the fantastic blue water and sailboats. The view is broken up by the large boulders that are the result of fantastic geologic actions many years ago. 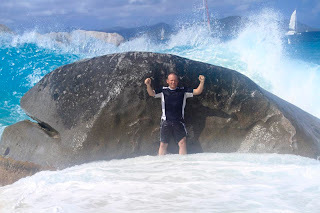 We walk down through the boulders to the beach, and begin exploring our way through the giant boulders, dark crevasses, watery pools, and rickety wooden staircases. With the surf up, the waves are thundering loudly onto Devils Bay at the far end of the Baths. Although too dangerous for a swim, the show of force is mesmerizing, and we stand watching it for some time. There's a large boulder sticking out of the sand on the edge of the water. At 7 feet high and 14 feet wide, it's an imposing structure and we watch wave after monstrous wave slam into the boulder, sending powerful spray high into the air, deafening us with the roaring of angry water. Look at the SIZE of the incoming wave! And then we get this brilliant idea. Wouldn't it be fun to stand in front of the boulder? Of course, Randall will have to try it first, since I'm holding the camera and all. It's a thrill unlike any other. We each venture cautiously out to the rock between wave sets, and anchor our legs to the ankles in sand so we won't get washed away when the waves come. And then you stand there, fear welling in your throat as you feel the water at your feet sucked into the oncoming wave. On shore, someone yells, "Here it comes!!" and everyone scrambles for higher ground, turning as they run as if hoping to catch one last glimpse of you before you are swept away to Davey Jones' locker. When the wave finally slams its full fury into the rock at your back, you actually let out an uncontrollable cry of terror. A cry which no one could possibly hear over the water explosion taking place all around you. The water bursts forward, completely immersing you as it explodes over the boulder and flies, airborne, toward the well-wishers on the beach. After a great morning at the Baths, we stopped for lunch at the Top of The Baths Cafe before making our way back to Spanish Town, and then out to the boat. 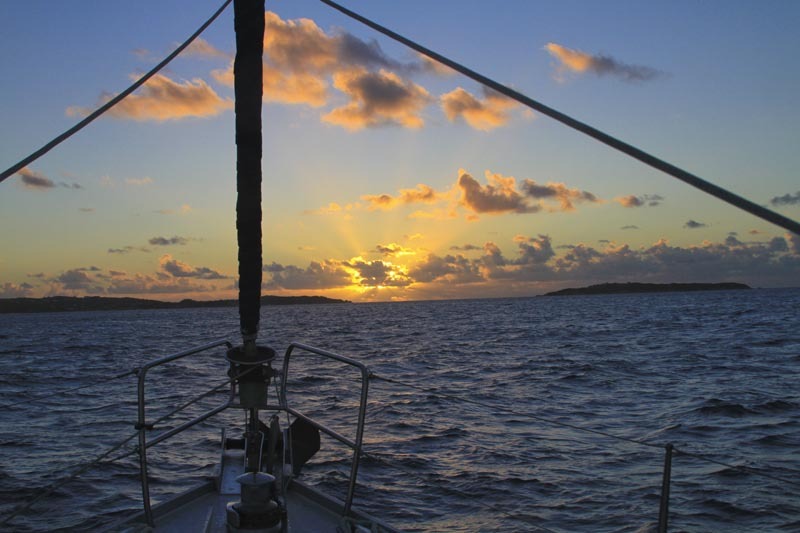 We sailed for Trellis Bay. Best shots I've ever seen of the baths with the waves up. Well done. Can't wait to hear about your trip this summer! Wow, I missed the Baths on my last BVI trip because the red flags were on the beach. I assumed there was nothing to do there when the waves were up. Never occurred to me to go up to Spanish Town. Thanks for the travel tip! From the looks on your crews faces, you do a great job finding the fun.